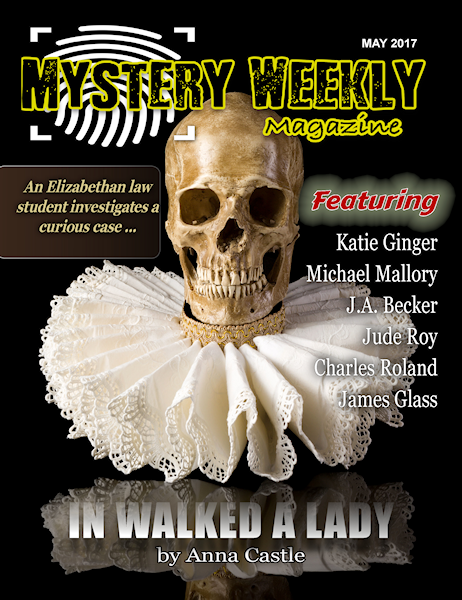 "Tattersby and the Silence of the Lumbs," by Neil Schofield, in Alfred Hitchcock's Mystery Magazine, May/June, 2017. Yes, this is the third story I have chosen from this particular issue. Some weeks/issues are like that. It is also the third time I have featured a story by my friend Neil Schofield. Because curiosity is a more interesting word. And it's more friendly. A curiosity tickles the mind. A mystery is obscure, menacing. Mind you, a curiosity can become a mystery when it grows up. I like curiosities. I like it when a curiosity comes out of the undergrowth and rubs itself against your legs. A mystery just runs up and bites you in the calf. In this story there are several curiosities (or worse) that disturb Tattersby's peace. His friend Eggy, a former crook, needs some help with his aunt who thinks she is losing her mind. Tattersby solves that one but quickly learns that a young constable has disappeared, a corpse has been found in the canal, and a convict named Mental George has been seen in the vicinity. Not to mention the haunted house, or as a local kid calls it, "a ornted 'ouse." Naturally all these pieces come together in interesting ways. More Tattersby, please. "It's a Mad, Mad, Mad, Mad Girl!" by Jeff Cohen, in Alfred Hitchcock's Mystery Magazine, May/June 2017. Years ago Akashic Press published Baltimore Noir and it had a story by Charlie Stella. I don't remember anything about that tale except that as soon as it was done I thought: I gotta get me some Charlie Stella books. And of course, that's one reason novelists write short stories. Getting paid to advertise your books is pretty cool. All of which brings me to Jeff Cohen, who also writes under the name EJ Copperman. Based on this story I gotta get me some Jeff Cohen books. Elliot runs a movie theatre that shows nothing but comedies, most of them old. That may explain why Sharon, a doctor, divorced him years ago. Harder to explain is that she's about to have Elliot's baby. Like today. Elliot rushes her to the hospital and promptly bumbles into a supply closet where a man in scrubs seems to be in the act of killing a woman in scrubs with a knife. Awkward. And when he gets hospital security and they rush back to the closet there is no one there. No sign of a struggle. Which leads the cops to question our hero. "Why are you here in the hospital today, sir? "My ex-wife is having a baby." Oh, yeah. That sounds good, doesn't it? Cohen writes funny. Here is Elliot talking to his wife. "You keep a civil tongue in your head, young lady, or I'll marry you again." Little Big News: Anthony Nominations! The Anthony Award nominations have been announced. The winners will be revealed at Bouchercon in Toronto in October. Congrats to all the nominees! Read about the other awards here. "The Montclair Dead-Star Comedy Revue," by Michael Mallory, in The Mystery Weekly Magazine, May, 2017. First of all, congratulations to The Mystery Weekly Magazine. I understand that a story they published will be in the 2017 edition of Otto Penzler's Best American Mystery Stories, and another made the Distinguished Story list in the back. That ain't no small stuff. This is a good issue and the best story I have read so far is this historical show biz tale by my friend Mike Mallory, making his third appearance in this space. Buddy Barker is short, fat, and funny. He was born to be a second banana comedian in vaudeville, but it's the 1950s and vaudeville is dead. Lucky for him he has found a job in live TV. Unlucky for him somone commits a murder in the theater. The producer decides that Buddy, who is liked by everybody involved, is the right guy to look into the matter for him. But playing detective is not one of Buddy's specialties. He's trying to stay out of the way of the cops and - much worse - an investigator for the House UnAmerican Activities Committee. The story has some clever twists and the murderer's, shall we say, career path, is unique. "Money Maker," by Jas. 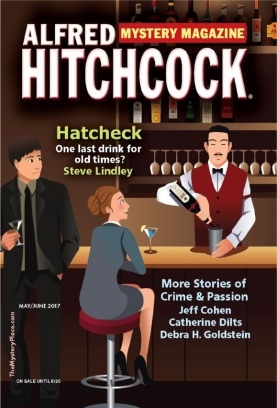 R. Petrin, in Alfred Hitchcock's Mystery Magazine, May/June 2017. I admit to being a major fan of Leo "Skig" Slorzeny. This is his fourth appearance in my weekly best list. Petrin's protagonist is an aging loanshark in Halifax, Nova Scotia. There is a "demon" eating up his guts - in earlier stories it was an "imp," so I guess it is getting worse - and it will kill him if one of his many enemies don't get around to it first. In this story Skig has done an unnamed favor for a couple of Maine crooks and they send him the agreed upon fee. Unfortunately, half of it turns out to be counterfeit so Skig sets out to figure out who along the line of shipment shorted him. He is accompanied by his sidekick, Creepy Culbertson, who fixes cars in the garage that Skig has renovated into living quarters. "I thought you had a front-end alighment to do." "Won't your customer be wanting his wheels back?" "Don't see why. He don't even have a driver's license. I'd be doing the world a favor, keeping that boozehound off the road." Under the chairs a sight the media might describe as "distressing to some viewers." Another highlight of this story is meeting Saul, Skig's attorney for, I believe, the first time. Here they are having lunch. "And you went to meet this man so that you could..."
"Take a delivery. A sack of cash." Saul clucked his tongue. "The kitchen's noisy. I didn't hear that." "The kitchen's at the other end of the room." "Yes. They're incredibly clumsy in there." But the highlight of any Skig story is Skig. People underestimate the aging thug in all sorts of ways. "There's nothing nice about me. Nothing at all," he says, after doing something nice. No heart of gold here, he insists, merely balancing the books. And that's a subject of importance to any loanshark. It's that time of year when you can't turn around without more well-deserved mystery awards being bestowed. Congratulations to the winners of the 2017 Derringer Awards, just announced by the Short Mystery Fiction Society!